After two weeks in Ubud, Denpasar was a homecoming. The sidewalks, once devastated and dangerous, were now a welcome challenge. Whereas we used to scrutinize the small food stalls, we now embraced the Balinese capital’s food scene with an enthusiasm borne of one too many tourist plates. You’d think the largest Muslim country in the world would be the last place for decent pork, but on the Hindu island of Bali, they prepare the beast with fine abandon. 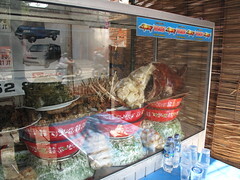 The pig itself is roasted on a spit for hours, during which the cook rubs the skin with coconut water. This results in a golden-crisp skin that melts in your mouth. This is babi guling, roast suckling pig, and you’ll find plenty of Balinese to call it their favorite dish. I knew right away that our guesthouse had steered us to the right place. There wouldn’t be any silverware on display here; heck, there weren’t any walls. When it runs out of pig for the day, the restaurant folds up and leaves only an empty sidewalk. The stall is a museum display of pig anatomy that fell in the hands of a deranged chef: fragrant blood sausage, fried intestines, as well as crispy and curried organs line up from the tail to the golden-roasted head. Every part is intriguing, surprising and delicious. Listen: bacon has nothing on babi guling. We had stepped off the tourist path in Denpasar; now it was time to go get lost in the wilderness outside. Helene and I caught a local bus to Gilimanuk, and during the four hour ride through the hills of West Bali, a poor woman in front of us lost her stomach to the many bumps in the road. Helene gave her some tiger balm to help with nausea, and as rice vomit still sloshed about our feet, we shook her hand as she got off the bus. From Gilimanuk, we took the ferry across the Straight of Bali, then rode a crowded bemo (local minibus) south to Banyuwangi. The next morning, five hours of train took us to the small town of Probolinggo. Most tourists only see Probolinggo’s train or bus station; but when we explained to a tour operator who tried to corner us into a package deal that we were not particularly interested in the nearby volcanoes, he stared at us as if we had professed a taste for barbecued babies. Yet once we stepped into the city’s traffic-choked streets, we knew we were somewhere special. Smiles and waves soon left us dizzy, as the entire town seemed to cheer our presence. A teenager, his face split in half by a grin, shook my hand, exclaiming, “Welcome to ProboLINGgo!” Everywhere we went, we found simple, wholesome, amazing food, and amazing people cooking it. We found a small restaurant painted in blue, with an antique vise-like ice shaver in front. It belonged to a pencil-mustached old man, who welcomed us with a gentle smile. Verses of the Qur’an hung on his walls, complementing the man’s quiet, knowing pride. Helene ordered soto ayam: a chicken broth served over rice and bean sprouts, with pieces of chicken and a healthy dose of lime. This was no industrial bird: the flesh was darker from oxygen and exercise. Like the roosters that woke us up in Indonesia, this bird had once serenaded the sunrise. The next day, we met the man’s three grandchildren, who waved us over from across the street. A small army of excited girls soon crowded Helene, eager to practice their English, and fascinated by the snow on Helene’s postcards of Canada. S-, a neighbor girl, wearing an orange dress and a white hijab, stared at us with wide, piercing eyes. When her face exploded in a smile, she exposed her missing front teeth. Later, on the way back from an Internet café, the girls waved at Helene across the street. Encouraged by Helene’s response, they were soon cheering at her in riotous enthusiasm. In Probolinggo, I was the partner of a pop star. On our last morning in town, enjoying the powerful sweetness of kopi (coffee, always served with cane sugar), Helene taught the owner’s two granddaughters and their now hijab-less neighbor how to fold origami frogs. T-, the youngest of the three, showed incredible skill despite her age. S- became braver, and fired off sentences in Indonesian at us, prefaced by the English words ‘My name is’. She figured we would automatically understand anything that came after these three words. Two hours to Surabaya, and we crashed for the night. The next morning, we caught an early train to the Central Java city of Yogyakarta, five hours away. Yogyakarta was everything I expected Ubud to be. Touristy enough to afford us a clean room and a broadband connection, yet far enough away from the tourist circuit that the people we met were gentle, smiling and warm. Here, we slowed down our pace, and decided to wait out the remainder of our stay in Indonesia, sitting on our balcony, watching life go by, only telling the time by the calls to prayer. At dinner, we followed our nose. One such trail took us down a side street, to the stall of an old woman and her daughter. We stood watching them chop vegetables, then cook them over coals in a thick wok. We sat down and enjoyed an amazing bakmi ayam (noodle soup with chicken). The older woman was so happy to hear me compliment her dish with my rudimentary Indonesian that she soon patted my shoulders every time she came by. She laughed heartily, and I felt I had found an Indonesian aunt I never knew I had. “Bakmi enak!” she laughed, repeating my words over and over. The next evening, we came back, but my Indonesian aunt was gone. Instead, her daughter was manning the stall with her twelve year-old girl, who expertly cleaned the wok and tended the coals. Together, they cooked us the best nasi goreng (fried rice) I ever had, and cap cay ayam (sautéed vegetables and chicken) for Helene. We ate slowly, watching the sparks fly from the coals, my adopted niece standing close, fearless, a fire priestess in training. Java had provided me an amazing selection of coffee so far, but there was one more cup of java I had to try. After the mosques announced nightfall, we made our way north of the train station. We found the street: narrow, with low tables strewn across the broad sidewalk to the right, and mobile stalls on the left. A heady smell of roasted coffee welcomed us: it was time for java joss. We sat on the wooden bench of the smallest stall we could find. The owner put two scoops of coarse coffee grounds in a glass, added unrefined cane sugar, then topped it off with hot water. When the glass was warm enough, he picked up a piece of glowing coal. The glowing coal went into the glass. Steam hissed, and the smell of caramelized sugar filled the air. Java joss was born before our eyes. I didn’t sleep that night from the caffeine rush. It was worth it. Eight hours after leaving Yogyakarta, we are sitting in an air-conditioned restaurant in Jakarta, lapping up its meager wifi. We have fled the smog and the noise, and are celebrating the end of our 1,000 km trip. Urged by Ubud to step off the beaten path, we have traveled Indonesia and met its people and food. I think back on Probolinggo and the man who shook my hand. I think of my aunt in Yogyakarta. 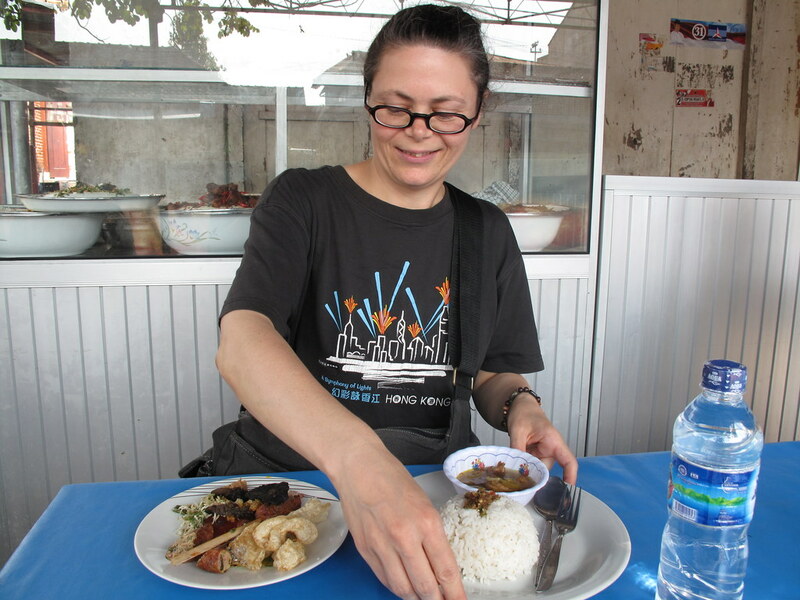 I think of all the other meals, too: the Chinese Indonesian woman in Denpasar, and her sweet and spicy fruit. The Muslim woman who served us rice and vegetables. 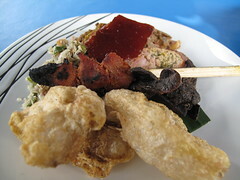 The rice we bought from a street stall in Ubud, our first glimpse of real Indonesian food. The gado gado on a Probolinggo sidewalk. The girls who cooked an amazing nasi goreng near our Denpasar guesthouse. Professor Ayi’s chicken satay (sate ayam) in Probolinggo. The sweet and spicy sate babi – pork skewers – in a dusty Denpasar stall. A fresh durian juice, with tones of onion and Brie cheese. 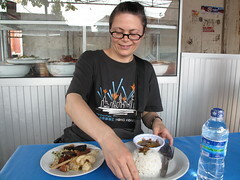 This is how I was meant to travel: by slowing down, and enjoying people and culture, one meal at a time. Denpasar has too many amazing street stalls to single them out – brave the sidewalks, and try one out for yourself! For babi guling, you’ll spot them around lunchtime, and they’re usually gone by dinner; ask your guesthouse or hotel for a street stall nearby. Probolinggo was an amazing experience, but I wouldn’t describe it as ‘beautiful’ or ‘calming’. Your experience may vary, depending on your resilience to busy Asian cities. I strongly recommend Professor Ayi’s sate ayam; you’ll find him with a street cart marked ‘P. Ali’, across from the clock on Probolinggo’s main street. He’s the cart with the lines waiting for take-out. Yogyakarta offers an incredible dearth of cheap local grub, including the delicious nasi gudeg (rice with young jackfruit and coconut), which you’ll find east of the kraton (Sultan’s Palace). For java joss, you need to go after dark: follow Jalan Malioboro north past the train tracks, and turn left on the first street past the station. Wherever you go in Java, take the time to stop in the cities not listed in your Lonely Planet. Smile at people, and sit on a dirty sidewalk filled with manual workers or taxi drivers. You’ll be in for a fantastic experience. whatta beautiful ‘foodie blog’ you’ve made. If some other time you visit Indonesia again, don’t forget to send me email, because I would like to invite you to taste our comfort-home cooking. I live in Jakarta. I should tell you, the food variation in Jakarta (and its street food-culture)is quite huge, as long as you find the right source/place. 2 hours from Jakarta, you can visit Bandung, food and fashion city, which famous with their super-tasty culinary variant. Havea good life there, dear friend! See you soon! sure, daniel! 🙂 love food, against war! I like soto ayam very much hmm yummy!